Will Anderson inadvertently breaks up a key suffrage rally when he thwarts a gunman set on killing his lover, Elizabeth Hume. No one else saw the man, and Elizabeth believes he hallucinated the entire incident, a side effect of the radium "treatment" he received at Eloise Hospital. She asks him to sit on the sidelines while she and her companions try to get the women's suffrage amendment passed by Michigan voters. Instead, Will sets out to protect Elizabeth and prove his sanity. Will's nemesis, Sapphira Xanakis, contacts him with news of a conspiracy to defeat the amendment, led by Andrew Murphy, head of the Michigan Licensed Beverage Association. Against his better judgment, Will believes she is trying to help. The man she directs him to dies under suspicious circumstances. An old acquaintance of Will's, who is working for the MLBA, is shot and killed in front of him. Still, no one believes Will, including his former ally, Detective Riordan, who not only is unwilling to help, but seems to have secrets of his own. With new death threats against Elizabeth and the next rally only a few days away, Will has to unravel a complicated tapestry of blackmail, double-dealing, conspiracy, and murderbefore the killer has his next chance to strike. Johnson's immaculate plotting and high-tension writing make for a spellbinding read set in early twentieth-century Detroit. The man in the gray suit slipped behind a marble pillar and appeared again on the other side. His face was shaded by the brim of his fedora, but his eyes seemed to linger on the policemen. Unlike the two thousand other people who filled the convention hall at Wayne Gardens, he didn't even glance at Elizabeth, who stood at the lectern onstage. Behind her, a dozen women sat in front of a burgundy velvet curtain, beneath a large canvas banner that read: MICHIGAN EQUAL SUFFRAGE ASSOCIATION ELECTION RALLY: SPONSORED BY THE DETROIT SUFFRAGE CLUB. Elizabeth held her arms out to her sides, gesturing for the crowd to quiet. My only, albeit infinitesimal, complaint is that sometimes Johnson's story arc and wickedly sharp characterizations fall second place under the weight of these meticulously researched descriptions. But as I think about it, that may just be Johnson's secret to plot pacing. Because he is indeed a master at establishing a finely tuned tempo, holding a reader just breathless enough to keep turning page after page. (Reviewed by Donna Chavez). Starred Review. Johnson does for early 20th-century Detroit what James Ellroy did for 1950s Los Angeles, creating a noxious brew of violence and corruption in his fourth novel...The complex plot works, and the detection and action scenes combine for a thrilling read - the series' best so far. Starred Review. Will's fourth is his best outing yet, packed with action by turns funny and chilling and deftly blended with the historical background. Before there was Henry Ford's Model T, there was the Detroit Electric Car Company's Tornado. It is protagonist Will Anderson's pride and joy in D. E. Johnson's Detroit Shuffle. Johnson's fictional Anderson is supposedly the son of the actual founder of Detroit Electric, William C Anderson. 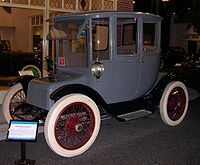 Even today, the company is touted as one of the most, if not the most, successful electric car manufacturer in the United States, with total sales from 1907 to 1939 of approximately 13,000 vehicles, including trucks and, later, ambulances. So popular were their cars that Clara Ford, wife of Henry, the founder of the Ford Motor Company, drove a 1914 Detroit Electric Brougham. The Lola Quartet is a work that pays homage to literary noir, is concerned with jazz, Django Reinhardt, economic collapse, love, Florida's exotic wildlife problem, crushing tropical heat, the leavening of the contemporary world, compulsive gambling, and the unreliability of memory.